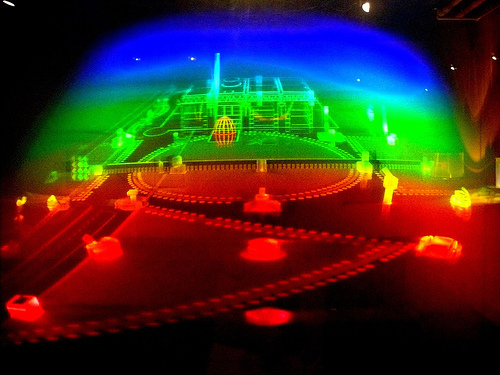 General Electric Global Research is the latest company to show the holodisc. These optical discs are the same size as the CompactDisc we’ve all known for decades, and the subsequent DVD and Blu-ray formats using the same disc size, but the holographic nature crams up to 500GB of data on a single disc. GE claims their version of the micro-holographic discs is backwards compatible with DVD, CD and Blu-ray Disc. This is a compelling feature if its true. Of course previous companies boosting holodisc priced vaporware players upwards of $20,000. Hardly a consumer-level product. While many people still think digital delivery is the future, I don’t know how soon this is going to be a reality for high-bandwidth content. Vudu offers 1080p/24fps movies that take hours to download for a quality quite inferior to Blu-ray. With 3D content you’re essentially using twice the video storage and bandwidth, not including data required to sync up both left and right images. Blu-ray has the capability to stream two simultaneous streams of 1080p video, but the storage is capped at 50GB currently. The holodisc offers 100-times the storage capacity. “The day when you can store your entire high definition movie collection on one disc and support high resolution formats like 3-D television is closer than you think,” says GE’s Brian Lawrence. The future I see for some time down the road will have higher-quality video and audio delivered on physical optical discs or flash drives, with lower quality coming through digital download. There is certainly enough financial incentive to keep selling physical media for at least a few more years, and download quality will continue to lag behind in the meantime. The new micro-holographic disc formats out there may just be a pipe dream. At the very least it is nice for a nerd like me to know there are other nerds out there making science work every day.